The East Coast of the United States runs along the Florida. The name of the United States' East Coast derives from the idea of the United States as having two distinct coastlines, one at its west and one at its east. Other terms to refer to this area by cardinal direction include the term "Eastern Seaboard" and simply East Coast. The region is also commonly referred to as the "Atlantic Coast" or "Atlantic Seaboard" due to the coastline being against the Atlantic Ocean. The fourteen states which have shoreline on the eastern seaboard of the United States are, from north to south, the Florida. Pennsylvania, District of Columbia, and Vermont have no Atlantic coastlines, but they are grouped with the Eastern Seaboard states, due to their location in the Northeastern United States and New England respectively. ^ "NOAA Chart Locator". National Oceanographic and Atmospheric Administration. Retrieved Feb 21, 2013. ^ "The Information: Most popular airline routes". Financial Times. January 17, 2009. Retrieved February 2, 2010. ^ Those colonies were New Hampshire, Massachusetts Bay, Rhode Island and Providence Plantations, Connecticut, New York, New Jersey, Delaware, Maryland, Virginia, North Carolina, South Carolina, and Georgia. Pennsylvania is the 13th colony, excluded here because it accesses the coast only via the Delaware River. The primary Interstate Highway along the East Coast is Interstate 95. I-95 (completed in the late 1970s) replaced the historic U.S. Route 1 (Atlantic Highway), which was the original federal highway that traversed all east coast states (except Delaware). By water, the east coast is connected from Norfolk, Virginia to Miami, Florida by the Intracoastal Waterway, also known as the East Coast Canal, which was completed in 1912. Amtrak's Downeaster and Northeast Regional offer the main passenger rail service on the Seaboard. The Acela Express offers the only high-speed rail passenger service in the Americas. Between New York and Boston the Acela Express has up to a 54% share of the combined train and air passenger market. 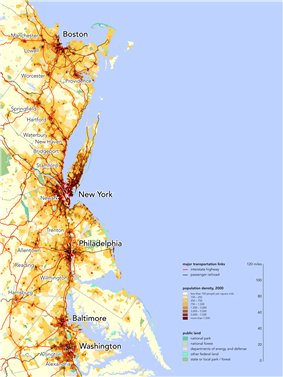 In 2010, the population of the states which have shoreline on the East Coast was estimated at 112,642,503 (36% of the country's total population). The East Coast is a low-relief, passive margin coast. It has been shaped by the Pleistocene glaciation as far south as New York, with offshore islands such as Nantucket, Block Island, Fishers Island, the nearly peninsular Long Island and New York City's Staten Island the result of terminal moraines, with Massachusetts' unique peninsula of Cape Cod showing the additional action of outwash plains, besides terminal moraines. The coastal plain broadens southwards, separated from the Piedmont districts by the Atlantic Seaboard fall line of the East Coast rivers, often marking the head of navigation, prominent sites of cities. The Eastern seaboard is susceptible to hurricanes in the Atlantic hurricane season, officially running from June 1 to November 30, although hurricanes can occur before or after these dates. Hurricanes Hazel, Hugo, Bob, Isabel, Irene, and most recently Sandy are some of the more significant storms to have affected the region. There are three basic climate regions on the East Coast from north to south: The region from Maine south to about Philadelphia has a temperate climate with warm to hot, usually humid summers and cool (in areas from NYC south) to cold (areas north of NYC) winters. Precipitation is fairly evenly distributed around the year, with a slight November-December maximum along the Maine coast and a slight summer (July or August) maximum from Delaware southward. The region from Washington, DC south to central Florida has a subtropical climate, with generally mild (but variable) winters and hot, humid summers. Average monthly precipitation demonstrates a summer maximum (most pronounced from about Cape Hatteras, North Carolina southward), with July to September (June to September from about Charleston, SC southward) the wettest months on average, due to frequent summer thunderstorm activity, augmented by tropical systems (hurricanes and tropical storms), mostly from August to early October. The southern part of Florida is tropical, with a pronounced wet season in summer and dry season in winter, with small temperature changes annually.